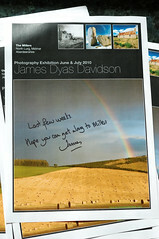 James Dyas Davidson: Last few weeks! My first solo exhibition finishes at the end of July so if you're in the area and can get along to Millers (which has a restaurant, gifts, deli, books, clothing etc.) I would be delighted. I'm looking for some comments on the exhibition too, good and bad! Go to www.jamesdyasdavidson.com for more.